Reading area challenge.......can you find some stories written by the same author? These boys found 10 books written by Julia Donaldson. Well done! Y1 have been learning about adjectives and they thought of their own to describe the ghost from the poem "The Small Ghostie"
Writing area challenge......make a party invitation for Kipper the dog. Working in the construction area making new beds for Kipper the dog. Who remembered to make a label for it and use an adjective?! We love playing the "Phonics Cups" game! Point to a cup, say the phoneme, then lift up to see if a pom pom is hiding under it. Some children really enjoy making and writing real and nonsense words in the phonics area. We love our new Alphablocks letters! More Y1 children writing super sentences today, remembering their full stops and capital letters! These Y1 girls are learning how to spell 'because' and use it in their sentences. Construction area challenge - Can you build a model and write some labels for it? More sentence writing on the carpet, practising those full stops and capital letters. We have been trying hard to write questions this week. Can you guess which animal this question is for?! Whole class phonics, writing sentences containing "air" words this week, and trying hard to remember our full stops and capital letters. Our challenge on the phonics table this week was to sort the trash from the treasure. We recorded the treasure and trash words. It's been a spooktacular week so far in Y1 this week, with lots of challenges to get our teeth into! Writing our own magic potions for Meg and Mog. Building a spooky castle for Meg and Mog. Writing ingredients lists for Meg and Mog. Making different phonemes with the playdough. Writing the correct words to go with the pictures. Upper & lower case letters matched and ordered. 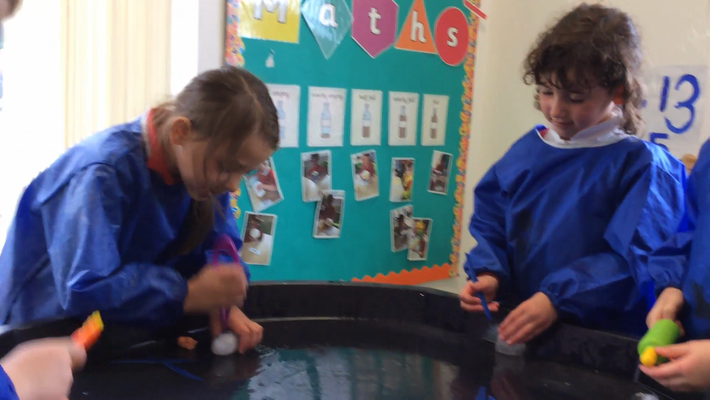 A Magic Potion Station appeared in the outdoor area this week and the Y1 children were bubbling with excitement. Inspired by the Meg and Mog story, they began to create their own spells and potions! Write your own spells here! Spooky soup in a pumpkin bowl and bottled potions. A spooky spell ready to be tested! Precision pouring is important for potion making. Would you like to try some?! Matching words to the correct pictures. Obb eats nonsense words and Bob eats real ones! Searching for words that contain 'ng' and 'th'. Writing cvc words on the beanstalk leaves. This term we will be learning about Explanation Texts, Animal Adventure Stories, Invitations and Non - Chronological Reports. We have been reading different Elmer stories and have started planning our own Elmer adventure. Developing communication skills. Which tools are the best?